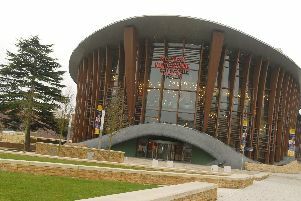 I only hope The Sun’ll Come Out Tomorrow as Bank Holiday Monday was pretty dismal weather-wise and it was only brighten up last night thanks to an evening at Milton Keynes Theatre watching that perennial musical family favourite, Annie. Forget the original 1982 film and the more recent Will Smith version starring Jamie Foxx for this touring stage production, directed by Nikolai Foster, is a tighter, spruced up tale about America’s best loved orphan. That’s not to say the storyline has changed that much from Thomas Meehan’s original book, for our little 11-year-old heroine is still searching for ways to escape the clutches of that boozed-up New York orphanage manager Miss Hannigan – played by Birds of A Feather star Lesley Joseph – in the hope of finding her parents. Miss Joseph – wearing a ginger and grey wig plus Nora Batty-style wrinkled stockings – really throws herself into a role which could have been written with her in mind. She’s perfect and certainly deserved the rapturous applause at the final curtain! She also belts out the Little Girls number and is later joined by her brother, the cunning chancer Rooster and his moll Lily in Easy Street. In fact Lesley has such a raspy, yet melodic, voice that she sounded as if she’s just puffed 20 cigarettes before going on stage. Interestingly she doesn’t try to put on a New York accent – unlike Lily Tomlin in the original film – and forgetting that she’s now 71, she is absolutely brilliant when she joins in the dance routines with aplomb. But she’s even better when snarling abuse at the orphans at every given opportunity – We love you Miss Hannigan! – and as the gin-soaked tyrant, she also tries every trick in the book to prevent Annie from finding a way of escaping from her clutches. For those not familiar with the storyline – and there surely can’t be many of them! – the show is set in the time of the Great Depression of 1930s America with Annie having been left on the doorstep of the orphanage by her desperately poor parents. They also left a note saying that they will return to collect her one day when things improve and they also leave her with half a locket... and you’ve probably guessed the rest! On Monday evening the six orphan children are from Team Liberty – Team Tiffany and Team Rockerfeller being the others – while it was 12-year-old Anya Evans who took on the starring role as Annie although Elise Blake and Madeleine Haynes also take it in turns. With wonderful numbers like Maybe and the show’s most associated song Tomorrow, Anya also leads the foster kids in the catchy It’s A Hard Knock Life as they scrub the orphanage’s floors and change their bedding. During the dance routines, my eye always seemed to focus on little Molly (played on this occasion by seven-year-old Andie Jordan) while all the other youngsters are fabulous and despite their tender ages, they more than hold their own. However I must say that their voices did tend to be rather high pitched, almost to a point of screeching and, with those added American accent, the actual dialogue was often difficult to understand, particularly early in Act One. There’s also a cute two-year-old stray Labradoodle called Sandy (it’s really Amber!) which is befriended by Annie after she escapes the orphanage in a washing basket… and the dog often threatening to upstage them all! Meanwhile there’s a great dance routine as New York’s homeless and down-and-outs hit rock bottom in Hooverville, only for Annie to be returned to the orphanage by Police Lieutenant Ward (Callum McArdle) before she is selected to spend two weeks over the Christmas period as the guest of billionaire tycoon Oliver ‘Daddy’ Warbucks. Her I’m Gonna LIke It Here is one of several show stoppers after Annie settles into the Warbucks mansion, musical veteran Alex Bourne bringing so much to the part with his rich baritone voice, especially in Something Was Missing and I Don’t Need Anything But You. And his equal in the vocal stakes is his Girl Friday assistant Grace Farrell, played by Holly Dale Spencer who is no stranger to Milton Keynes audiences. In Act Two we are transported to a commercial radio station advertising toothpaste where compare Bert Healy (Lewis Bradley) leads the three slutty-looking Boylan Sisters in You’re Never Full Dressed Without A Smile… it’s a brilliant number which is immediately reprised by the six orphans. With Warbucks planning to adopt Annie, first he offers a $50,000 reward in the hope of finding Annie’s real parents… but it’s Jonny Fines as Miss Hannigan’s con-man brother Rooster and the lovely Djalenga Scott as his glamorous girlfriend Lily who come forward. Calling themselves Mr and Mrs Mudge who now live in Canada, they are thwarted and exposed as frauds by wheelchair-bound US President Franklin D Rooservelt (played again by Callum McArdle) after he calls in the FBI to help correctly identify the tricksters. It means Annie is finally able to be adopted by Warbucks – and that means it’s still the same story that we’ve all come to know and love, the ‘feel good’ finale featuring A New Deal For Christmas and a reprise of Tomorrow which really brings the house down. Charles Strouse and Martin Charnin’s original score is as fresh today as it was in back in 1982 while under keyboard-playing musical director George Dyer, there are six other talented musicians in the live orchestra pit who never miss a beat. Meanwhile choreographer Nick Winston’s cracking dance routines, Colin Richmond’s sumptuous staging and Ben Cracknell’s clever lighting all help make Annie a really popular production and an outstanding family show for the school half term. It plays Milton Keynes until this coming Saturday There are performances – which last two hours and 20 minutes including the interval – every evening at 7.30pm while there are also matinees on Wednesday, Thursday and Saturday at 2.30pm. Tickets are available from the box office, by calling 0844 871 7652 or by visiting www.atgtickets.com/miltonkeynes (booking fees apply).